Building and flying indoor rc airplanes has become increasingly popular in recent years, with the abundance of good quality micro planes readily available. With electronic components for the radio control flying hobby becoming so small and lightweight, it was inevitable that this sector of the hobby would see an increase in popularity. The great news is that indoor rc planes are readily available in Ready To Fly (RTF) form, and this is ideal for the newcomer to the hobby. But if you do prefer to build, there are plenty of kit choices available too. Typically these kits are designed to utilise components from RTF micro airplanes (motor, ESC & servos etc. ), so a badly damaged RTF foamie indoor plane has a good chance of being resurrected as something else! Suitable venues for indoor flying include sports halls, gymnasiums, aircraft hangers and the like - any large open space with a high ceiling will do. As previously mentioned, indoor rc airplanes can be purchased RTF and ARF nowadays, whereas a few years ago modellers had to construct their own, either from scratch or by modifying free-flight indoor kits primarily designed for rubber or CO2 power. Planes like the ParkZone Ember and Vapor, shown below, are excellent choices for beginners to indoor flying. Both RTF, the small size, ultra light weight and slow flying characteristics make them very suitable indoor rc airplanes indeed. 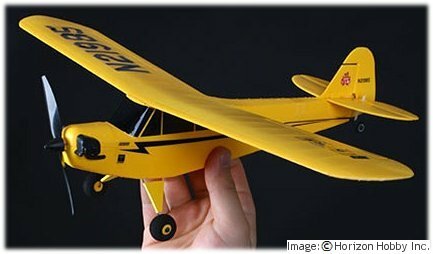 A popular example of a scale rc airplane very suitable for indoor flying is ParkZone's Ultra Micro J-3 Cub, shown below. This 18 inch wingspan plane has been a popular choice for indoor flying enthusiasts and is very comfortable flying round a school gymnasium or similar venue. Its stable high wing design make it an easy plane to fly, quite suitable for the novice. Above: RC airplanes like this J3 Cub are lightweight and small - perfect for indoor flying. Indoor rc airplanes don't have to be slow flying though, but it stands to reason that the faster the plane is, the larger size hall you need to fly in - faster planes eat up more airspace. Such faster flying aerobatic rc airplanes are readily available, but they're not suitable for beginners. Planes like the ParkZone Sukhoi SU-26XP is one such example, shown below. Of course, rc airplanes like these that are great for indoor flying can also be flown outdoors, but are much more affected by the wind; even a gentle breeze may be too much for the plane to handle so ideally they should be flown on calm days only. But with that said, most of the Horizon Hobby brand Ultra Micro planes (UMX) come equipped with AS3X™ auto stabilisation technology. With it, they are not adversely effected by wind gusts and so don't suffer the normal twitchiness of small planes being flown on a windy day. A slightly different breed of indoor rc airplane is the 'shock flyer', or shockie. These ultra-lightweight planes are typically made from Depron foam sheet and carbon strip for strength. They have large flying and control surfaces so they are 3D capable, but at much slower speeds than their outdoor counterparts. A variation on indoor 3D flying is 4D, whereby the plane is fitted with a variable pitch prop and so 'reverse maneuvers' can be flown - if the pilot is good enough! This vid shows the extremely gentle nature of this style of indoor rc flying, and in capable hands the planes are a joy to watch. Flying indoor rc airplanes is not only great fun but it's also a good solution to those winter-time blues, when the weather is against you every weekend and you can't fly outdoors. Indeed, organised indoor flying meetings are commonly held during the winter months. If you do have a large indoor space in your area, ask around and you might be able to try some indoor flying for yourself! 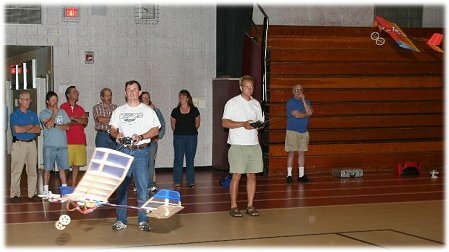 Above: Jersey Coast Sport Fliers flying some indoor rc airplanes. The planes shown throughout this page were very popular at the time of writing, but some are now discontinued although probably available on eBay. For a current choice of suitable indoor planes, click any of the images below to shop at Amazon - a good place to buy RC stuff these days!